Patients who want a vibrant smile can get optimal treatment for stains, chips or slight gaps with porcelain veneers from Dr. Ben Kacos. Optimal candidates for veneers have good periodontal and oral health, sufficient enamel and a committed oral hygiene routine. Once in place the veneers can provide a beautiful and lasting solution to your smile. Veneers are a cosmetic dental procedure where thin porcelain shells cover the surface of the teeth. Dr. Kacos usually recommends this treatment for cases of severe discoloration, minor fractures or chips and slight gaps in your smile. The shells are cemented directly to the teeth with a strong adhesive. 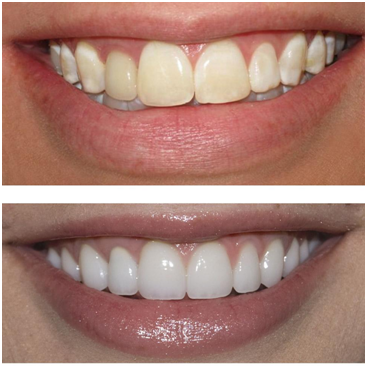 The results of veneers looks natural and beautiful, restoring confidence in your smile. During the initial consultation, Dr. Kacos will examine your teeth and mouth to get a general idea about your oral health and the conditions you want to improve with veneers. The first visit also includes X-rays and maybe even photographs in the evaluation process. With training from the American Academy of Cosmetic Dentistry, Dr. Kacos can create a custom diagnostic prototype or wax up to show you exactly what the final product can look like, this allows you and Dr. Kacos to fine tune the look that is perfect for you before you ever start. Once you have decided on veneers, Dr. Kacos removes about half-a-millimeter of enamel from the front surface of your teeth. This prepares the teeth and allows room for the placement of veneers. Then he will take a dental impression and send to an off-site dental lab. Skilled technicians will fabricate your custom veneers and send them back to the dentist. Dr. Kacos may provide temporary veneers while you wait for the delivery of permanent veneers. Usually he will place temporaries for patients concerned about the look or sensitivity of their teeth. During your final appointment, the dentist will remove any temporary veneers and etch your teeth with a slightly acidic gel. This roughens or texturizes the enamel on a microscopic level to help anchor the veneers. Then, using dental cement, Dr. Kacos bonds the veneers directly to the surface of the enamel. In most cases, patients can complete the treatment process with little or no need for anesthesia. The entire procedure usually takes between four to six weeks. What do custom veneers cost? The cost of this treatment can vary from patient to patient. Cost depends heavily on the type of veneers, the location of teeth as well as the number of teeth being treated. Because each set of veneers is specifically designed for you, you will have to consult with Dr. Kacos to get an estimate. Can I remove veneers later? Once placed, most patients can get at least a decade of wear from traditional porcelain veneers. Lumineers are ultra-thin and slightly translucent veneers, different from traditional veneers. These do provide some flexibility for patients if they wish to return to their natural smile, but lumineers are not viable options for every case. Because the dentist must remove part of the enamel for veneers, they are permanent solutions for your smile. 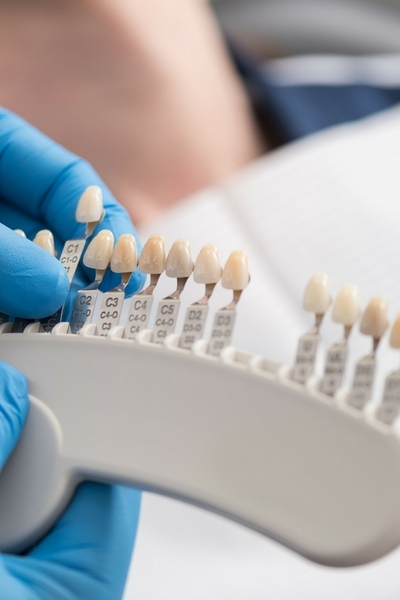 One of the most important decisions you make when considering veneers is choosing a dentist. It could be the difference between good veneers and great veneers. Dr. Kacos is an experienced cosmetic dentist who values the combination of both art and science in the dental industry. He takes an artistic approach in all cosmetic treatments to provide seamless solutions for your smile. From Dr. Kacos, you can expect precise, truly stunning results that look natural. Call us today at (318) 869-2593 to learn more about porcelain veneers or other cosmetic dental treatments we provide. Think You Are a Candidate For Porcelain Veneers?